On a quiet Sunday morning a buzzing anticipation abounds as museum-goers descend en masse towards the cavernous entrance of the year’s most anticipated show. De Kooning: A Retrospective, on view at the Museum of Modern Art through January 9, has transformed MoMA’s 17,000 square foot sixth floor into a mecca for Willem de Kooning enthusiasts. Nearly 200 paintings occupy every wall, and span every period in the artists’ seven decade career, from his highly technical training at Rotterdam Academy of Fine Arts and Technique to the last paintings of the 1980s. The exhibition proceeds in a roughly chronological fashion, opening with two early paintings, Seated Man (1939) and Seated Woman (1940), which introduce de Kooning’s continuous journey between the tradition of figuration and avant-garde abstraction. The first room also displays two academic drawings completed as a student at the Rotterdam Academy, irrefutable evidence of the impressive facility he relied on throughout his life. 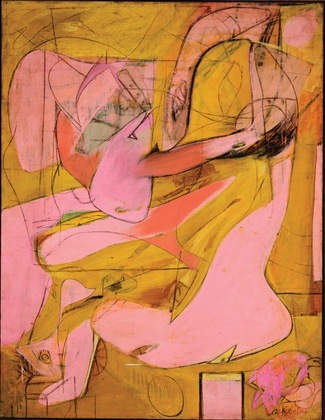 From the onset of his career there are signs of an artist with an endlessly flexible imagination; de Kooning flirts with many styles and subjects, always moving between representation, abstraction, and formal play.